Air travel is a strange thing, when you really think about, and to be honest I try my best not to. Hundreds of people sealed into a aluminium tube hurtling through the troposphere at 600 miles an hour. You get to share some recycled air, eat food that can range from OK to horrible – unless you are in Business or First Class, which we are not – and queuing for the teeny, tiny bathroom facilities. Long-haul air travel in economy is something to be endured. Those sharing this experience sometimes make air-friends with those around them, the short-term acquaintanceship being a distraction from the mundanity of the travel. Others prefer to remain in isolation, not even speaking to their row-mates, the true introverts among us. No one seems to mind what you do – everyone is allowed to cope in their own way – although rudeness to fellow travellers and cabin staff is never tolerated, it seems. Once, on a medium-haul trip across the US on business, I stood up for a late border – I had the aisle, he had the middle seat. As soon as he sat down, he turned to me, the smell of booze from flights-past a presage of what was to come. “You are not one of those f***ing born-again Christians are you? I got one of those on the last flight”, he slurred. Errr, no, I stuttered, lying. “Good”, he said and started complaining about the delay in the flight, the length of the flight, the time between his connections, the lack of full food service on this flight and so on, loudly. He was a Kiwi, and bearing the same accent I was keen to disassociate myself from him. When the hostess came to offer a light snack, I mustered one of my best this-idiot-is-not-with-me looks. I avoided conversation as best I could, but as the New Zealand rep for a US broadcast technology company on his way to the same conference as me, it was difficult. No sir, we are unable to serve you more alcohol, was the only Gospel he got on that flight. Eventually he slept. So, to this flight, Auckland to Hong Kong. First time flying Cathay Pacific, first time long-haul on a plane with back-of -seat in-flight entertainment. I do wonder how in-flight culture has been impacted by the availability of back-to-back movies. Kung-Fu Panda 3, Spiderman the reboot, Batman, the reboot of the reboot, Diehard 6, Mad Max 7, or whatever number they are up to now. The only shared experience being the forgettable movie or three you watched in isolation, together. Or perhaps we shall be blessed with another sales rep. We shall see. 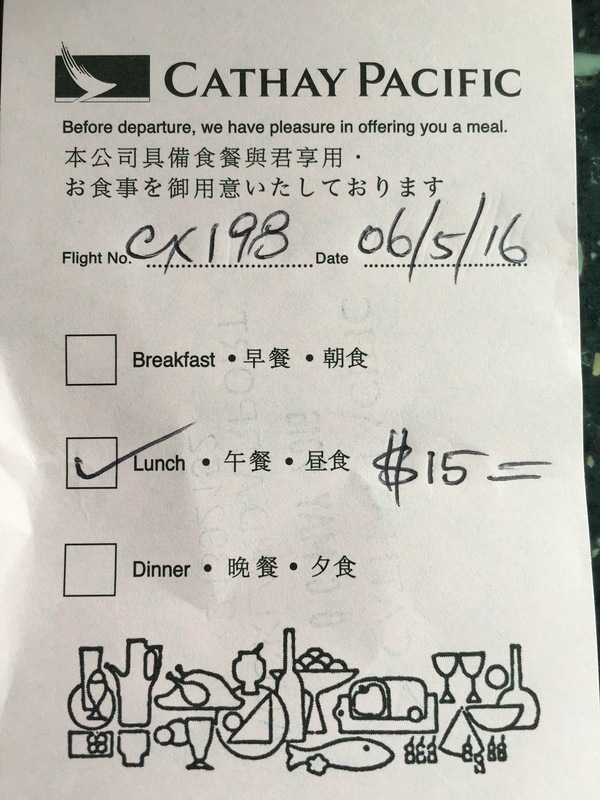 The flight’s been delayed 90 minutes, but very nice to get a couple of lunch vouchers. So, to lunch on the ground in a swanky Auckland International Airport Cafe, and then we embark on the first stage of our journey. First stop, Hong Kong.